Melbourne’s architectural landscape is a wonderful juxtaposition of modern and Victorian architecture. Although the CBD has been peppered with many skyscrapers, its historical structures have won Melbourne the title of “Australia’s most European city”. Perhaps the most striking example of this juxtaposition between old and new is the Coops Shot Tower situated within Melbourne Central and enclosed by a magnificent 20 storey glass cone designed by architect Kisho Kurokawa. Although an icon of Melbourne for locals, the rich history of Coops Shot Tower is unknown to many tourists. Built in 1890 at the peak of a period known as ‘Marvellous Melbourne’, it once stood as one of the tallest buildings in the city. As part of Melbourne Central’s 25th birthday celebrations, Rewind ’91, Melbourne Central and Melbourne-based virtual reality company Liminal 360 have collaborated to use the latest in VR technology, the HTC Vive, to create an immersive and interactive reconstruction of Coops Shot Tower. During the experience, users are treated to a private tour through material from the State Library archives by historian Dale Campisi, before venturing into the Shot Tower to experience it for themselves. The tower is 50 metres tall and was used predominantly to create lead shot for shotguns. 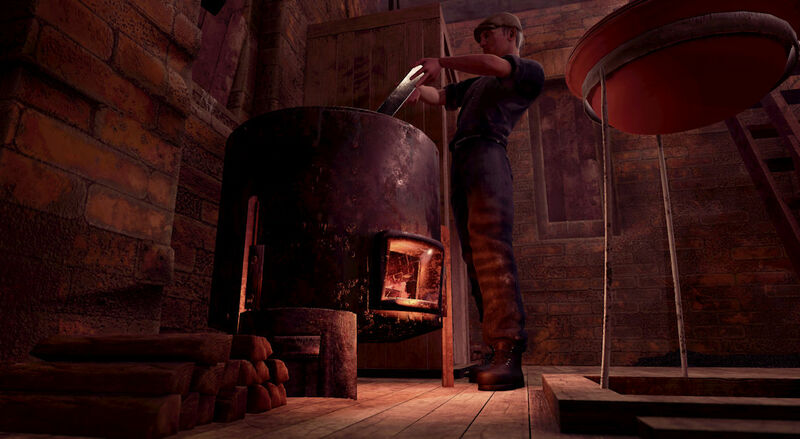 The shot maker would melt lead bars in a cauldron furnace and scoop up the molten lead with an enormous ladle, carefully pouring it into a large, perforated colander to create ‘drops’. Molten lead would rain down the height of the tower, forming perfectly spherical and aerodynamic shot on the way to be cooled and solidified by the water below. Today, shot is made with industrial machines and the process is largely automated; the days of standing inside a tall tower in a dimly lit room and manipulating molten lead by hand have been lost to the annals of history. However next month, history will be reborn and visitors to Melbourne Central will have a unique opportunity to go back in time to experience a taste of life as a shot maker! Lachlan Sleight, Liminal 360’s CTO and Lead Developer collaborated closely with local historian Dale Campisi, and was given exclusive access to the tower, taking meticulous notes, measurements and photographs of the heritage listed building and dilapidated machinery within. The result is a historical reconstruction of unusual authenticity, and the use of virtual reality technology makes the experience a benchmark for historical brand activation in Australia. This was an exciting project and we went to great lengths to accurately recreate the Shot Tower as it existed back in the 1890s. This meant not just recreating the space visually but working closely with sound designer Darius Kedros fromSonic State Design to really bring the space to life. Leigh Dunn, General Manager of Melbourne Central, said the virtual reality installation will be a key attraction for visitors during the Rewind ’91 birthday festivities hosted throughout September and also exemplifies the centre’s commitment to providing an engaging retail environment. The Melbourne Central Virtual Reality Experience will be located in Shot Tower Square, open Thursday to Sunday for the month of September. Following this, the experience will be relocated to the Shot Tower Museum as a permanent installation for visitors to enjoy. There is a second Coop Shot Tower on Alexandra Pde Clifton Hill at the gateway to the Eastern Freeway which has been in a dilapidated state for many years, though the structure in good condition.